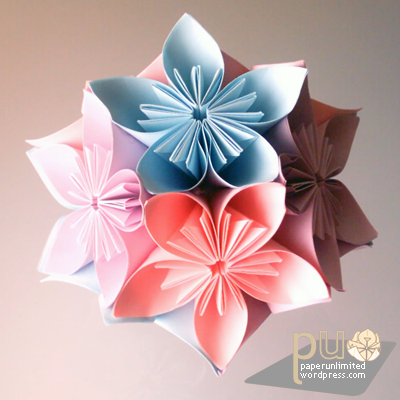 It was made with colored copy paper, with squares of 7,4×7,4 cm; the kusudama has a diameter of almost 11 cm. From 60 petals you form 12 flowers with 5 petals each. If you want to fold one go the the kusudama. This is diagrammed there. I’ve just noticed that the thread doesn’t show on the photo, but believe me: it’s there! This entry was posted on 2007|02|28 at 10:45 and is filed under kusudama (glued), modular origami. You can follow any responses to this entry through the RSS 2.0 feed. You can leave a response, or trackback from your own site. really well done! ^^ i love the soft colours ^^. but how did you glue it like that mine looks like it has been run over by a car ^^’ could you give me some advice?? Do you know how to fold the petal from a square to a oval 3d petal? I’m making them for the classroom Christmas tree. Hello Isa! I want to make this lovely kusudama but it seems I can’t find the diagrams or any video related to it… Would you be so kind to help me please?? ?